In transportation, a stopover (or layover) is a break in a single trip. When flying internationally, stopovers could be for an hour, half a day, or even overnight, and when travelling by car the same is true. In the past we used to drive right through to the various national parks and game reserves as we didn’t want to waste time out of the park when we could be photographing in the parks. We now realise this was a mistake. A safari stopover provides an opportunity to rest, de-stress, eat, charge your batteries and even to explore new destinations. When we drove through with no layovers we tended to arrive at the national park in a stressed frame of mind and it would usually take us three days to unwind. By stopping en-route we now de-stress before arriving at the park – so we are fresh and can concentrate on capturing good images instead of being tired and irritable for the first few days. Johannesburg to Etosha is around 1700 kilometers to the Andersson Gate or 1800 kilometers to the Galton and Von Lindquist gates. In Botswana the various hotels, lodges and B&B’s along the Trans-Kalahari Highway are not great with the exception of Cresta Jwaneng. 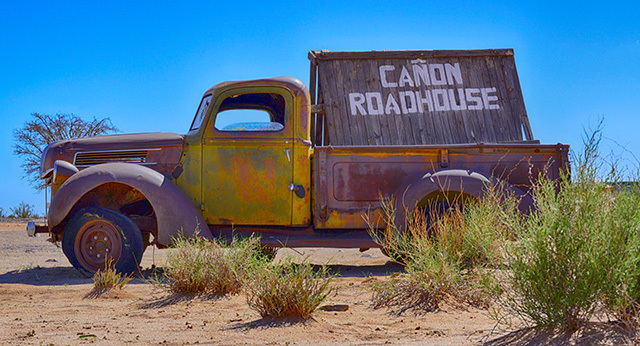 The rooms and food are very good, there is 24-hour security for you and your vehicle and it’s right on the main road. 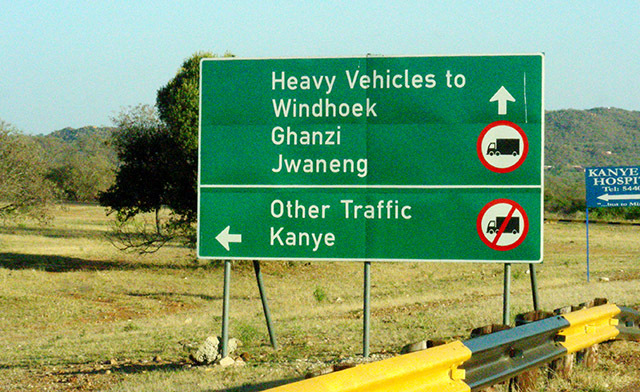 On the Namibian side of the border there are a few options. We have found the SanDune Lodge just outside Gobabis and Zelda's Guest Farm, about 20 kms from the Botswana border, to be very restful with nice rooms and good food. In Windhoek there are a few good places to choose from depending on your budget. 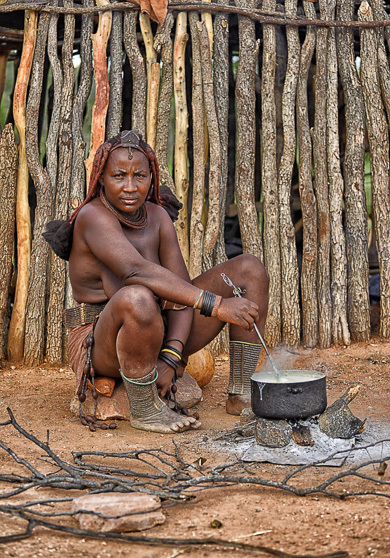 When staying near Etosha you should try and visit one of the Himba villages like the one at Toko Lodge. The Himba are a photogenic indigenous tribe and could be the most photographed people in Namibia! When traveling between Windhoek/Etosha and the Skeleton Coast Park (the home of the Namib desert elephants, rhinos and lions) an ideal place to stop is Damara Mopane Lodge. 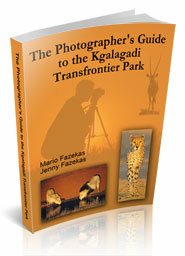 The distance from Johannesburg to the Kgalagadi Transfrontier Park is about 1000 kilometers. We usually leave home at 03h00 and arrive at the park at about 14h00 but this is a long, tiring trip. We then discovered Red Sands Country Lodge, which is just outside Kuruman (500 kms from JHB) and exactly halfway between Johannesburg and the park. 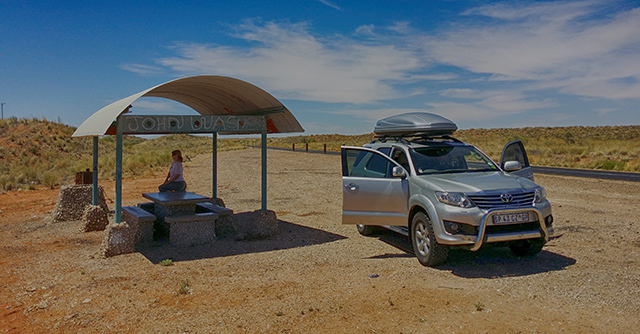 Another option would be for you to stopover in Upington (700 kms from JHB) as there are many small B&Bs to choose from, some facing the scenic Orange River, thereby leaving you with just 300 kilometers to drive to the park. On the return trip, however, this isn't ideal and Red Sands would be more appropriate as a stopover due to the distance. 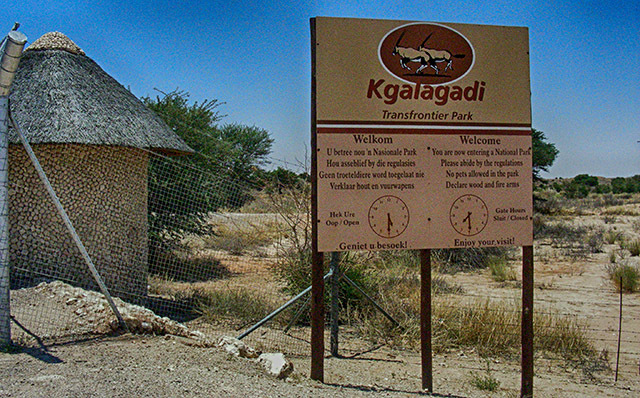 When travelling from Namibia to the Kgalagadi, or vice-versa, we have found the ideal safari stopovers to be either Kalahari Anib Lodge or the Kalahari Farmhouse. 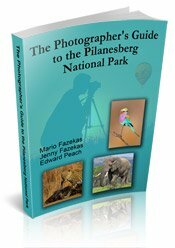 The Pilanesberg is just 150 kilometers from Johannesburg so most people don’t stopover but use the park itself as a safari stopover between Botswana and Johannesburg or Kruger Park. We have found the Golden Leopard resorts of Manyane and Bakgatla to be great for self drive Safaris and for guided safaris both Pilanesberg Private Lodge and Tshukudu Lodge are superb. 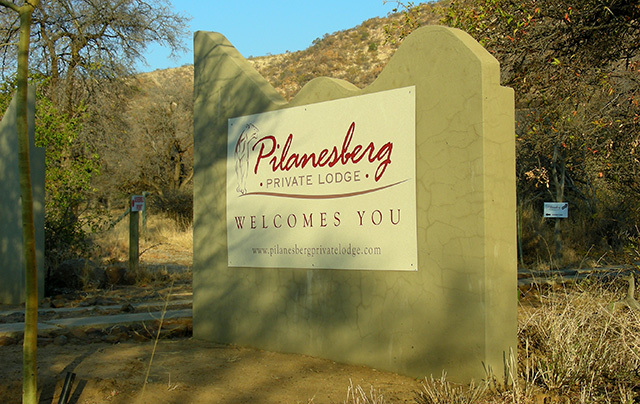 There are other lodges in Pilanesberg that you can read about on our Pilanesberg page. Madikwe Game Reserve is just 250 kilometers from Johannesburg so most visitors from JHB drive straight through but visitors coming from Cape Town usually stopover in Mahikeng (Mafikeng). We have stayed at a few hotels and B&Bs in Mahikeng and the best has been the Mmabatho Palms Hotel. The food and service are good and it is situated just outside the Mafikeng CBD so the environment is very relaxed. Travelers from Namibia and Botswana also tend to use the Mmabatho Palms as a safari stopover to places like the Kruger Park or Johannesburg. Another good safari stopover is Mbewa Cottages just outside Zeerust. It is currently ranked the top-spot on Tripadvisor for establishments in Zeerust and we can see why. We have stayed at a few other places in and around Zeerust but they were not good! Mbewa has earned the top-spot! If you would like to stay within Madikwe Game Reserve please check the list of lodges on our Madikwe page. 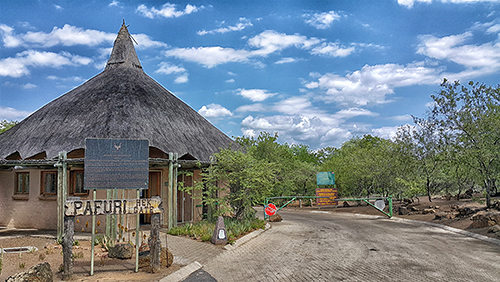 The Kruger Park is about 500 kilometers from Johannesburg and OR Tambo Airport so most visitors drive through but for those of you wanting safari stopovers there are many places to choose from! There are also many places close to the Kruger Park making up the Greater Kruger Park that can be used as stop-overs or as a base from which to explore the park as day-visitors. We will discuss some of them here and have divided the Kruger Park into three sections; north, central and south. In the far north there is Pafuri River Camp located on the banks of the Mutale River, just before it joins the Luvuvhu River and only a few kilometers from the Pafuri park gate. There is also Singo Safari Lodge, located in the Makuya Game Reserve that borders the northern Kruger Park along the Luvuvhu River. Then African Ivory Route offers accommodation in rustic, out-of-the-way places, close to the Pafuri, Phalaborwa and Orpen gates, and in the north there are two great lodges to stay at: Mutale Falls in Makuya Park and Awelani Lodge. All the above lodges are closest to Pafuri Gate - as at May 2016 there are no established lodges or guesthouses around Punda Maria Gate. 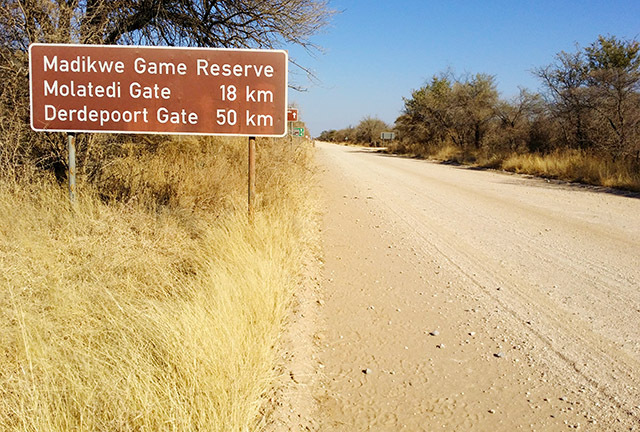 A new gate, called Shangoni Gate, is due to be constructed in the northern Kruger. It will be situated between Punda Maria and Phalaborwa gates and will follow the Shingwedzi River until it meets the main H1-6 road near Red Rocks. 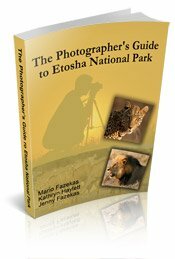 Close to Orpen Gate there is Ndzhaka and Buffelshoek, both situated in Manyeleti Game Reserve and Shalati Safari Camp just outside Manyeleti. Some park visitors like to stop off in Polokwane, which is about 250 kms from Punda Maria, making it a halfway stop between Johannesburg and the northern Kruger Park. Polokwane is about 200 kms from Phalaborwa and about 300 kms from White River / Hazyview so it is a good place to sleep over if you are travelling from far. When visitors fly into South Africa or travel from far destinations they would prefer to travel short distances so they can recharge before arriving at the Kruger so we used to recommend Old Joe’s Kaia, which is about 300 kms from JHB. (2018 update - Old Joe's Kaia is unfortunately closed to individuals plus the menu is now 100% vegan - they are chasing away their clients! This is the message on their website: "Old Joe’s Kaia Guesthouse and Restaurant have officially closed as from 31 October 2017. The facility will in future be used only for group bookings and events with 12 guests or more". Instead of Old Joe's we highly recommend Hamilton Parks Country Lodge or Hulala Lakeside Lodgefor safari stopovers. Both are situated between White River and Hazyview and have comfortable rooms, good food and great views. There are also many guesthouses to choose from around the two southernmost gates as safari stopovers. Rio Vista Lodge is situated right on the Crocodile River in the town of Malelane, Kambaku River Lodge is also situated right on the Crocodile River but just outside Malelane town, while Mhlati Guest Cottages are situated just a few kilometers from Malelane gate and Hamiltons Lodge & Restaurant is situated in walking distance of the Malelane gate. 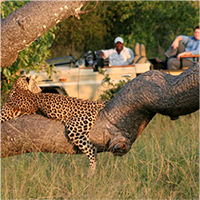 Boulders Safari Lodge is situated between the Malelane and Crocodile Bridge Gates but closer to Malelane Gate. We enjoy The Stoep Cafe Guesthouse and Tambarina Guesthouse & Restaurant, which are both situated in Komatipoort and are just 9 kilometers from the Crocodile Bridge Gate.